Ok - I have the 14 bit - what does the rest of the vaccine stand for? thedazza wrote: The viral marketing begins. Sorry to report, but that video is not related to Alton Towers and so the video is not official. 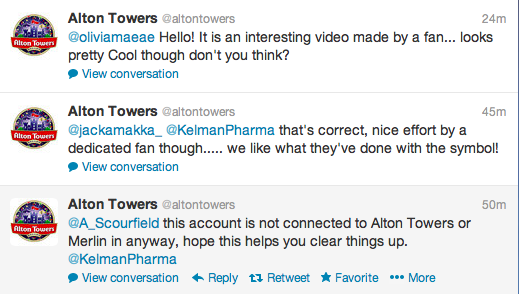 Alton have said so on their Twitter account. "Hello! It is an interesting video made by a fan... looks pretty Cool though don't you think?" Last edited by larrygator on Sun Dec 23, 2012 2:56 pm. ^ The other two tweets go against that. After weeks of speculation from the enthusiast community over whether or not SW7 will open on time, it looks as though the official ‘countdown’ on the Alton Towers SW7 mini-site has been removed, and replaced with very little new content other than the construction image from the email sent out several weeks ago. Although this does not confirm a delay, it may suggest an upcoming change in expected opening date for the project, as there is no longer any reference to the 16th March in relation to the coaster. Photos taken by TowersStreet contributors on Thursday 3rd January from the surrounding fields show that vertical construction of track has not progressed much further than when the official “It’s Coming” email was sent by Alton Towers on 20th December. Station steel is being erected, and work appears to be progressing at the top of the site closest to the entrance to X-Sector, but there is still a good deal of track remaining in the car parks awaiting transportation. If the ride does not open as planned, it will be the first new attraction at the Resort to open after the season has started since Rita, which opened 3 weeks into the 2005 season. What form of compensation will be offered to guests who have booked park tickets or hotel stays is currently unknown. Keep up with discussion about SW7 construction on TowersStreet Talk, or our dedicated SW7 Minisite and stick with TowersStreet news for the latest updates on when the ride will finally #geterected, as they come! Although, I am kind of sceptical. Yes, there could be some alterations or problems during the construction, most likely the British weather, but the mini site could just have had a face lift coincidently. Let the complaining begin. The down side of park's announcing an opening date so far in advance. But...but...I thought only Intamin rides had delays!?!??! Oh my god, who actually cares if a ride isn't opening on time? ^The people that booked trips out there just for it.